I’m going to show you how to cold smoke cheese on your grill, it is after all a great fall activity! As cool weather rolls in, there’s nothing like making your own smoked cheese at home. Let’s learn how easy it is to cold smoke cheese on the grill! We’ll also check out our new rig, the FoodSaver® FM5200 Vacuum Sealing System. It’s a cinch to use and seals up the smoked cheese perfectly! As you may have guessed, we’re not firing up the grill. We’re cold smoking, which means we don’t want the heat, we just want the smoke! As a matter of fact, you really want to do your cold smoking when the temperatures are below 70 degrees F., and you don’t want the inside of your grill to go above 90 degrees F. We’ll talk about ways to keep the grill cool, but with fall approaching quickly and winter nipping at it’s heels, we’ll be making cold smoked cheese in style for the next several months! Preparing cold smoked cheese is literally one of my favorite fall activities, and it will soon become yours too. Nope, you don’t need a smoke house or a big fancy smoker to make fantastic cold smoked cheese at home. Follow these easy instructions for cold smoking cheese on your grill, and your taste buds will be dancing in no time! Toss it on a platter with some meat, crackers, and jam — it’s a perfect snack to enjoy around the fire pit! A smoking tube and wood smoking pellets – we’re using Cherry, but Pecan or Hickory is also a good choice for smoked cheese. Meat, Crackers, and Jam to serve with your cheese. It’s easy to make smoked cheese at home on your grill. Pro Tip: Use trays of ice to keep your grill cool – ideal smoking weather is below 70 degrees F. and in the shade. You must keep the inside of your grill below 90 degrees F. or your cheese will melt and make a big flippin’ mess! I make sure my grill does not go over 85 degrees F. by using a digital grill thermometer, ice trays and keeping an eye on things. Today was 68 degrees and contrary to what the weatherman said, the sun made an appearance. Therefore, I also placed my umbrella over the grill so the sun wasn’t beating straight down on it. Fill your smoker tube with pellets and light it up. I use a kitchen torch to get things going quickly! Use a grill glove to carefully lay the smoker tube down on it’s side, close the grill lid and let the smoke begin to build for a few minutes. While the smoker tube is building up a steady burn, get your cheese and ice trays ready, and place everything on the grill. I place my cheese on the top rack and ice trays below them. Close the lid and let it smoke for about 1.5 to 2 hours. You can rearrange the cheese throughout the smoking session. I like to rotate the smoking cheese at least twice and flip it too, because the heat from the smoke tube can warm up the cheese that is sitting directly above it. 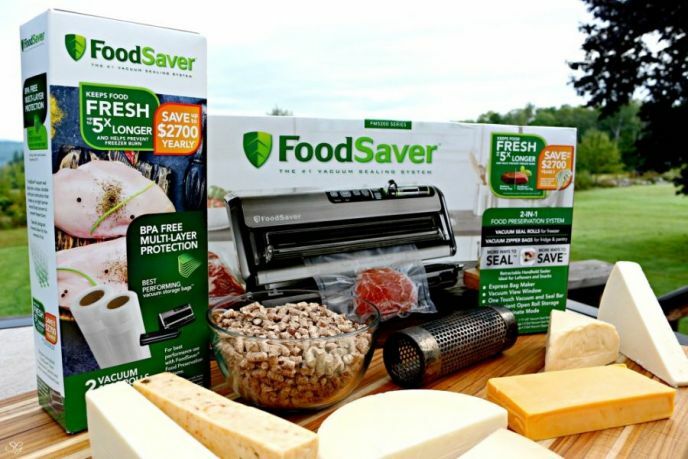 When the cheese has smoked for 1.5 to 2 hours, remove it from the grill and vacuum pack it with your FoodSaver® FM5200 Vacuum Sealing System – see detailed instructions below! Refrigerate for about one week before enjoying. Cut into blocks or slices and serve with meats like pepperoni or summer sausage, crackers, and jam. Using hard cheeses are the best choice for making cold smoked cheese at home because they typically have a moisture content of 50% or less, and will hold up better when smoking in your grill. We love our new FoodSaver® FM 5200 Vacuum Sealing System, it’s a worth-while investment for sure! From hunting and fishing to meal prep and storage, this thing will save us time and money. Whether you’re trying to keep foods fresher longer, or making delicious smoked cheese, FoodSaver® is the solution. It keeps food fresh up to 5x longer* and helps prevent freezer burn (*compared to ordinary storage methods). Use the FoodSaver® to save time and make entertaining effortless. You can marinate foods in minutes instead of hours, cook ahead, batch cook your meals and plan out your entire week with ease! These are just a few reasons that we decided to pick one up! Yes, it’s the one you’re thinking of FoodSaver® — As Seen On TV, and we’ve watched it in action many times. Finally, we grabbed one at Walmart — and it’s on Rollback! Now you can quit tossing food in the bin and have so much less waste, you won’t know what to do with the extra cash, perhaps a vacation is in order! FoodSaver® FM5200 Vacuum Sealing System – $142.99 (original price $169) – from 9/15 – 12/22, online only. Get it here. FoodSaver® 11″ x 16′ Vacuum Seal Roll, 2 Pack – $15.99 (original price $17.98) – from 9/15 – 12/22, online only. Stock up here. The FoodSaver® FM5200 Vacuum Sealing System is real easy to use. Read the owners manual and let’s get sealing! Plug in the machine and turn it on with the power button. Install the FoodSaver® 11″ x 16′ Vacuum Seal Roll and you’re ready to roll. Installing the FoodSaver® 11″ x 16′ Vacuum Seal Roll is really easy. Unlock the lever, flip open the Seal and Cut Bar, insert the roll and pull the bag until it reaches the white line. Close the Seal and Cut bar, move the lever to seal and it will automatically make the first seal! Next we’ll make our first bag. Unlock the lever and pull the bag to the desired length, figure about 3 inches longer than the food item you wish to vacuum seal. Once you have the size you’d like, flip the lever back to the seal position. This will create the bottom seal for the next bag. The red seal light will pulse while the seal is being created. No need to even press that Seal button, it’s automatic when you flip the lever! Third, slide the bag cutter across to cut the bag free. Because you’re in control, you have just created a bag exactly the size you need. Place a block of smoked cheese inside the newly created bag. With both hands, slide the open end of the bag inside the vacuum seal window. Once the open end is visible through the window, press and release the vacuum seal bar with both hands. Use your knuckles, it’s real easy to do. The vacuum seal window will close and grip the bag, beginning the vacuum seal process. Once the red light turns off, the vacuum sealing is complete and you’re ready to store your food. Yeah, this is my first round with the vacuum sealer, so my bag is a little big. I’m sure I’ll hone in my skills, as will you. Store the sealed smoked cheese away in the refrigerator for a week before diving in… Yes, after you taste test a little bit. 😉 And I know, it’s hard to wait and we all end up cracking the seal a little early, but it is worth waiting. Letting the cheese rest for a week after smoking it allows the smoke flavor to penetrate deep and takes off the bitter edge that you’ll experience with freshly smoked cheese. Anyway, this is my process. It’s real simply and the cheese is always delicious! Besides smoked cheese, the possibilities are endless with the FoodSaver® FM5200. So don’t forget to swing into your local Walmart, check out the home section and you’ll find the FoodSaver® FM5200 Vacuum Sealing System and FoodSaver® 11″ x 16′ Vacuum Seal Roll, 2 Pack right in the food storage aisle. Find FoodSaver® on Facebook and Instagram for more ingenious ideas and follow me on Instagram, Facebook and Twitter! LOVE BBQ? – Like my BBQ Facebook Page too! We love smoked cheese served with meat and crackers,on a salad, or on burgers! The combinations are endless! 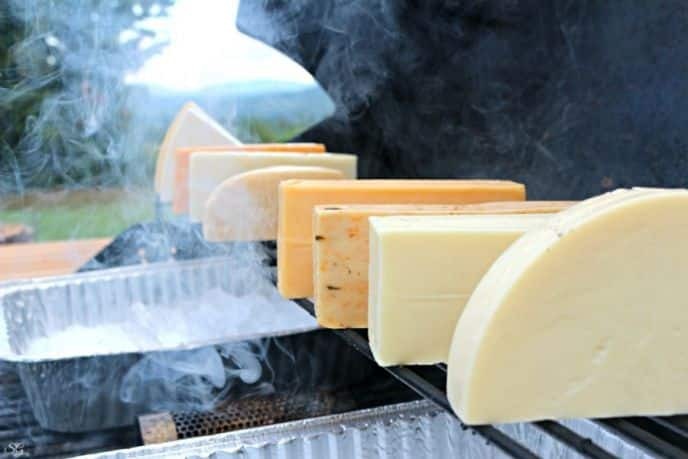 How to smoke cheese at home on a grill. A smoking tube and wood smoking pellets - we're using Cherry but Pecan or Hickory is also a good choice for smoked cheese. Meat Crackers and Jam to serve with your cheese. Fill your smoker tube with wood pellets and ignite. Close the grill lid and let the smoke begin to build for a couple of minutes. Add your cheese to your grill, remembering where you're putting each variety of cheese. Close the lid and let it smoke for about 1.5 to 2 hours. If you need to refill your smoke tube, do so carefully with proper gloves. To keep your grill cool add tin trays of ice. Do not allow your grill to get above 85 degrees F. or your cheese may melt! 90 degrees F. is the melting point of most cheeses. Note: The FoodSaver® FM5200 is an indoor appliance, but it was such a beautiful fall day I decided to vacuum pack my smoked cheese outside! How do you like to enjoy smoked cheese?